The Rays, as they did during the regular season, prove they are better than the Red Sox as they win Game 7. Now we wait and debate Who Is Our DH? 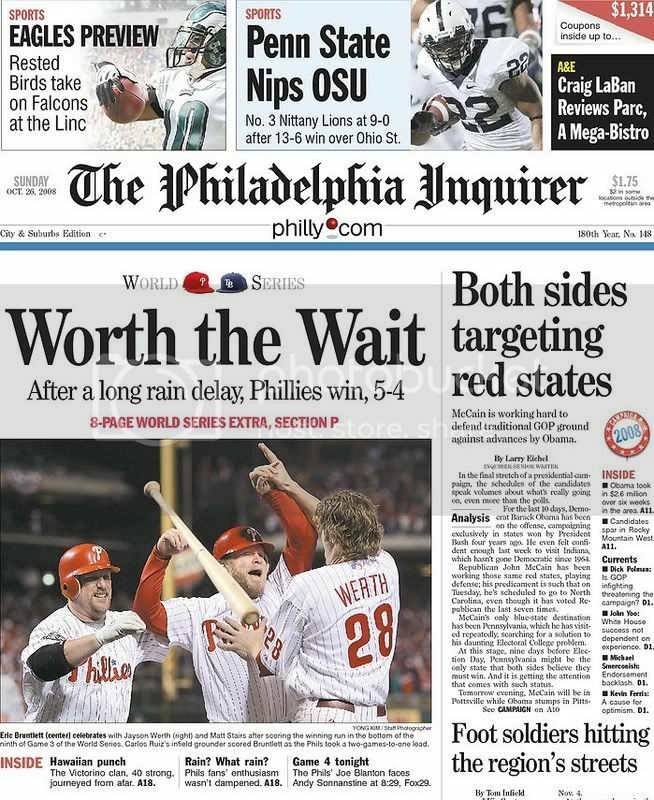 One more day to wait, good chance to worry about the Phils not getting any respect. 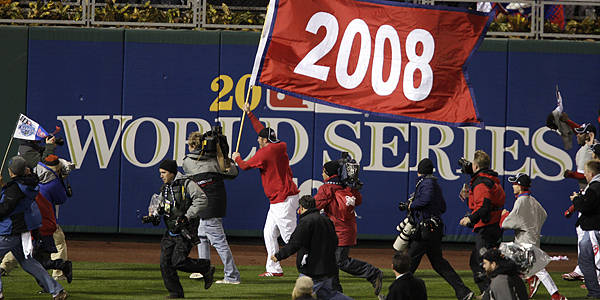 Time for Game 1 of the 2008 World Series. Phils first astroturf game of the season. Big win in the opener. 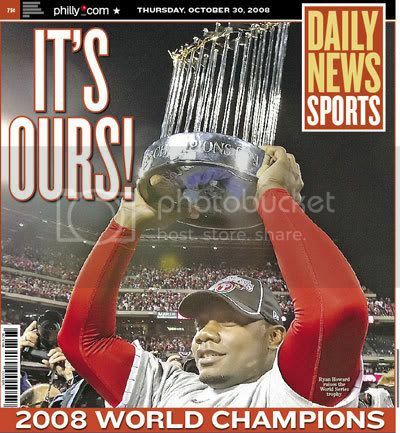 Forget the split in TB theory, let's win 'em all! Watching the financial crisis and the election play out at the same time is so freaky. Well, we split, now an off day. 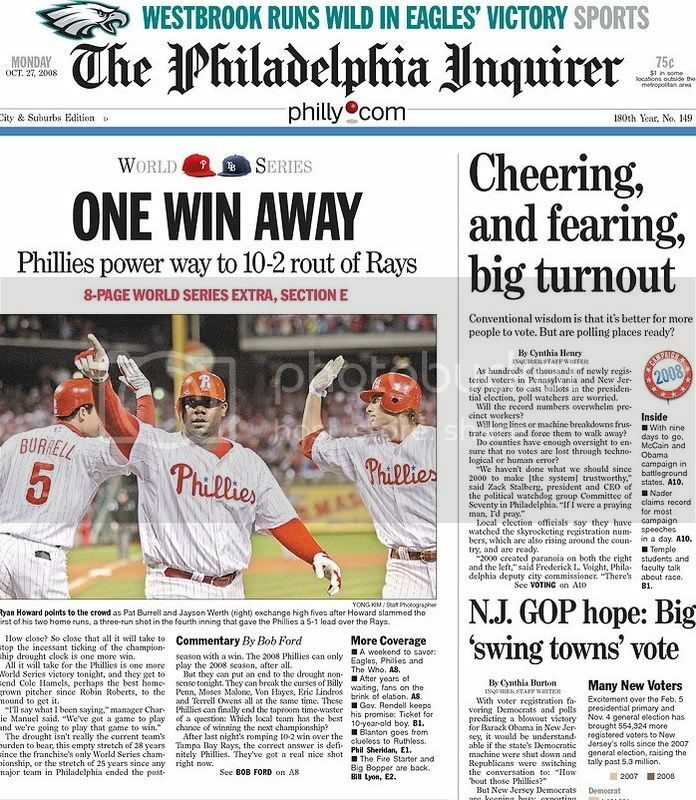 Not hitting much, so we're wondering if the Phils get a pass if they lose to what some argue is a better team, and some argue there's no way the Phils return to the World Series next season. Some feel like it's 1983 all over again. Woe is us! How many more games will we lose this season? I have tickets to Game 3. My first ever WS game in person. Game 3 in Philadelphia. Forecast not promising. I listened to the start of game one on radio while driving south in Florida toward the Tampa area. We attended game 2 at Tropicana. Since they only lost the one game I was there in person, I guess nobody will hold it against me. 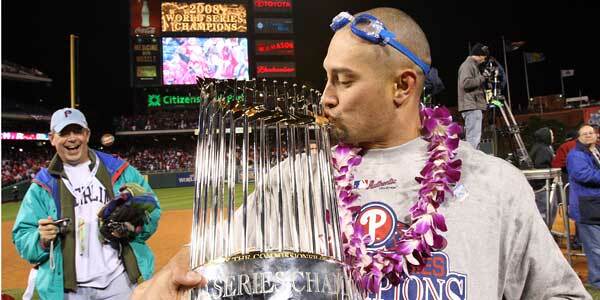 2008 was a special year for Phillies phans. 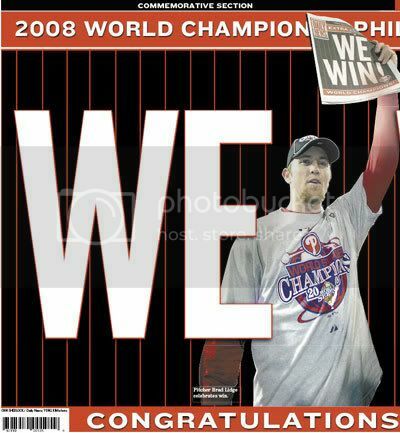 We need to get back into post season play and need to win another WS or two in the next several years. 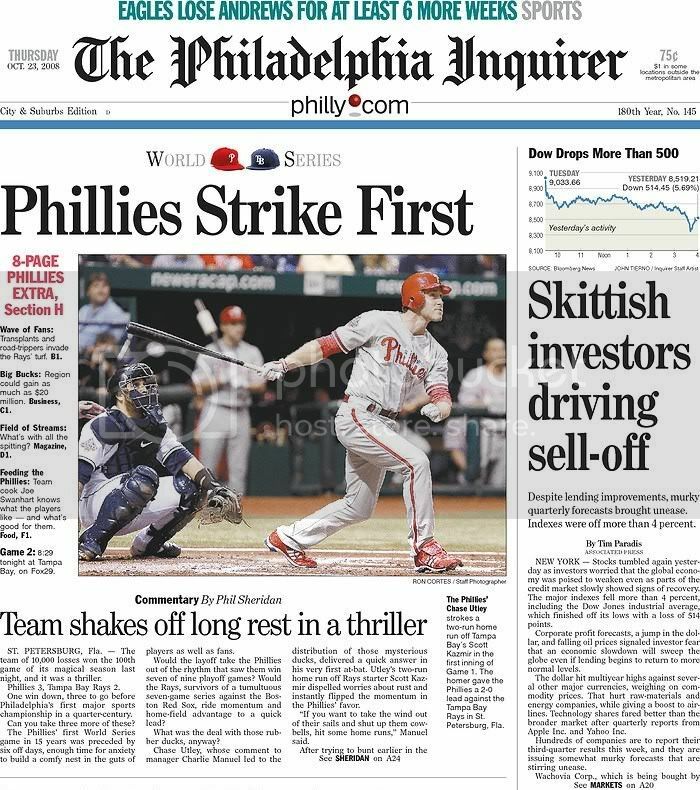 So the Phils walk it off this morning, take a 2-1 lead in the series. Guess it's not 1983 all over again. I was there for Game 3! My friends and I got there for the original start time but had to bide the time during the rain delay. We took cover and enjoyed Shmitters and a couple of rounds. Eventually, the game started, however. 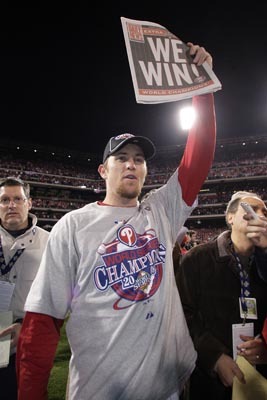 Nobody realized or cared that it did so at 10:00 p.m.. Utley's HR landed about four seats away from me. I have tried to find myself on replays but without success. Game ended at 2:00 a.m. but nary a person had left the ballpark. Despite the heavy rains earlier, the moon was out by the time the game ended. 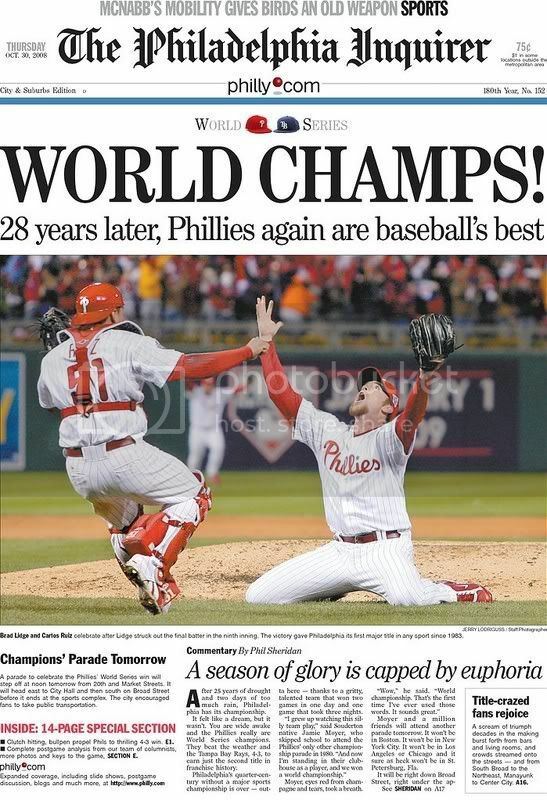 But yes, a thrilling finish which put the Phillies in control of the Series! It would be nice to not have to return to Tampa! Obama making a push for North Carolina. A fluke or will it be a swing state in coming elections? All we need is the weather to cooperate. 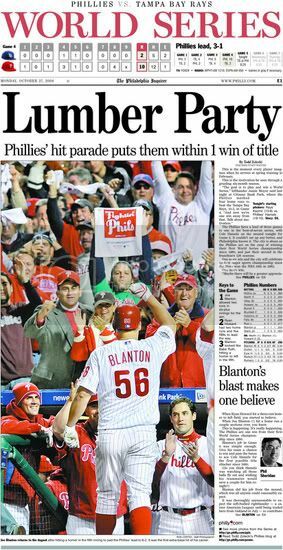 That Blanton bomb (also, he was unhittable. if memory serves there were some mild accusations that he was using something). And a lot of times with the cold weather, I'm not saying anybody uses anything, but if you use anything, a lot of times it's not as effective in cold weather. The normal stuff that every pitcher uses, sunscreen and resin, we're not loading the ball, it's just on it so we can get a better grip on the ball. You need to adjust that, as well. I didn't use anything last night, but I didn't throw any breaking balls. But tonight I'm going to make sure I've got what everybody uses, the essentials out there again. Well, that was...something. Rains come, they wait til Rays tie the score to call the game so now we wait after the first weather suspension in World Series history. 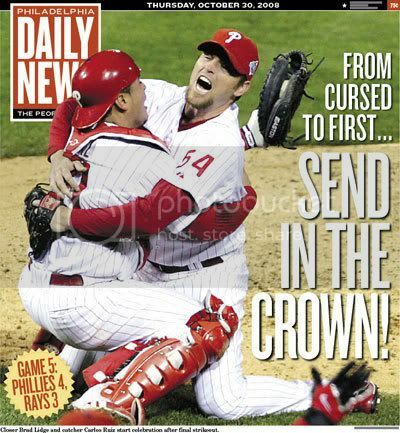 At some point on this day, 10 years ago, they announce that they won't try to resume the game today. A bombigenesis Nor'easter, as it turned out. The low blew up quickly and became a serious storm, and a cold one. Parts of the region actually got some snow. 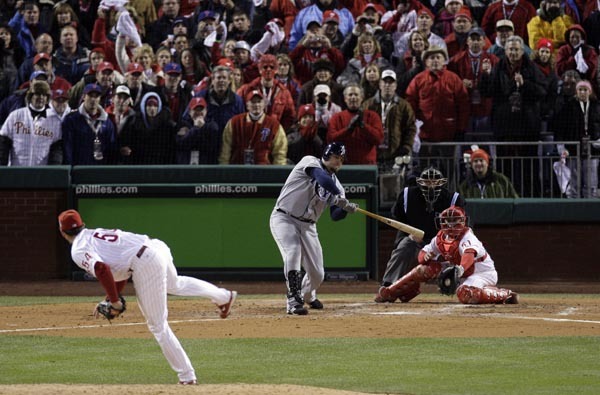 It cannot be said that Bud Selig handled this situation with aplomb. I heard on reliable information that he was made aware of the quickly developing weather situation and of the rapidly diminishing chances that the game could be played and completed but, yet, decided to start the game. 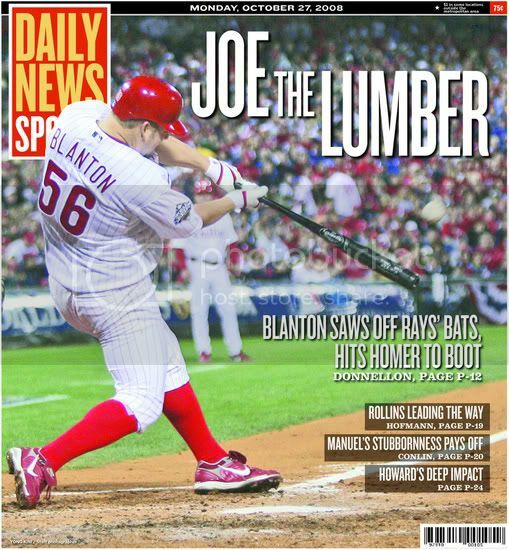 Then, he waited for the Rays to tie it before calling the delay. Game 5 set to resume. Some wondering how the atmosphere will be with the delay. 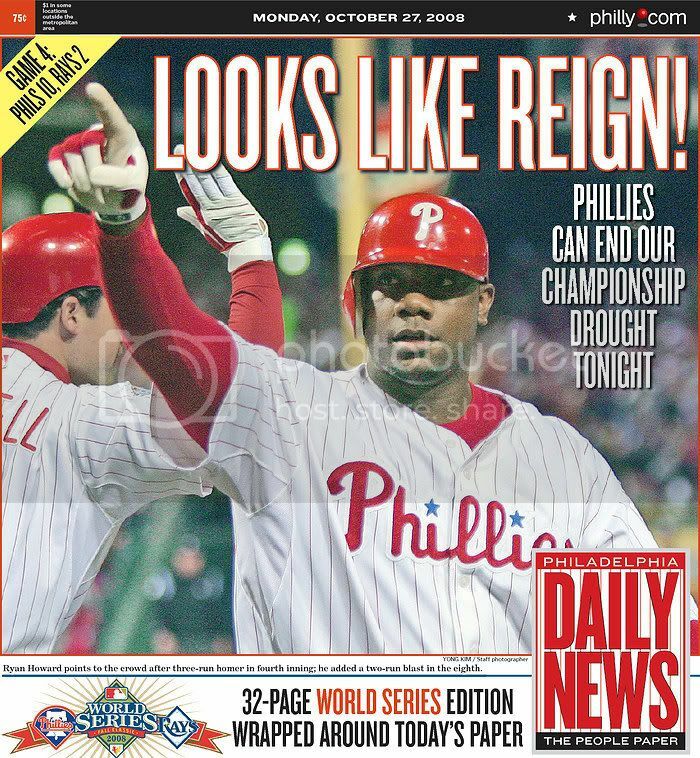 Has negadelphian dread reared its ugly head? We'll see. 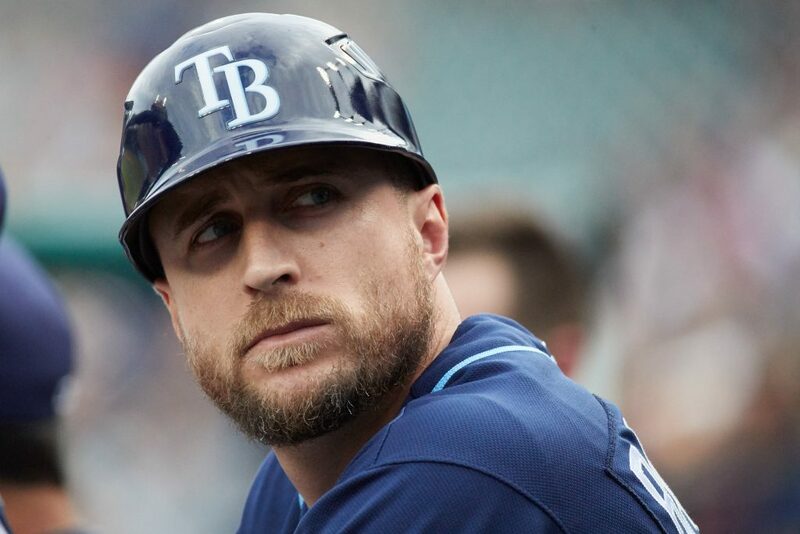 Some think the Rays' Rocco Baldelli may be a manager someday. The Twins will reportedly hire Rays field coordinator Rocco Baldelli as their new manager. 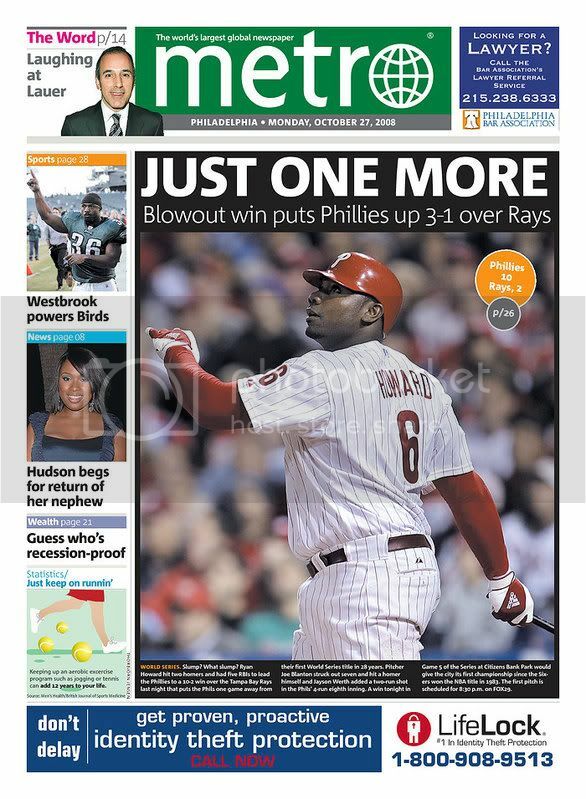 Read more at MLB Trade Rumors. 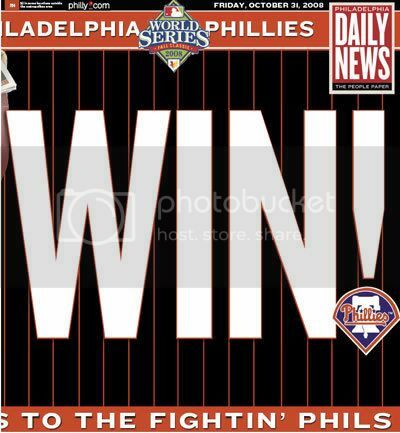 Cole Hamels to appear on Letterman tonight for some reason.